An Expedition 47 crew member photographed the Earth’s limb during a starry night pass. 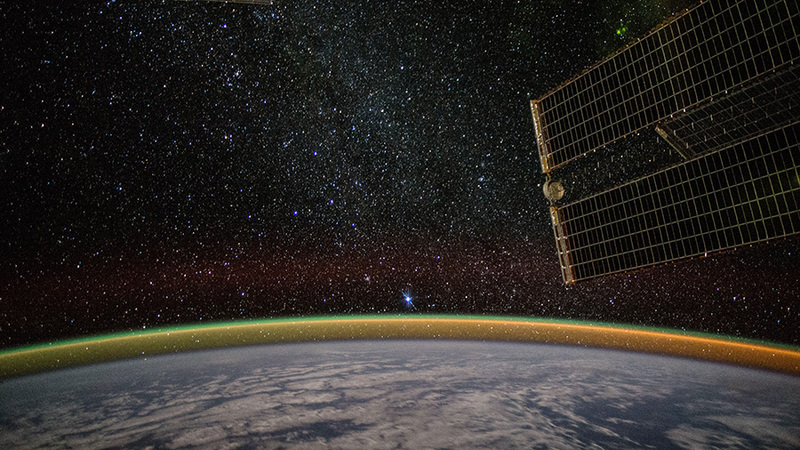 One of the International Space Station’s solar arrays is seen in the right foreground. This morning the three Expedition 47 crew members practiced evacuating the International Space Station in the event of an emergency. Afterward, it was back to work on advanced space science and orbital lab maintenance. Several times a year the station residents get together to practice the communication and procedures necessary to escape an emergency situation. The crew practiced departing the space station quickly today and entering their docked Soyuz spacecraft for use as a lifeboat. Before the emergency drill, Commander Tim Kopra of NASA and Tim Peake of ESA (European Space Agency) participated in a series of tests on a touchscreen tablet for the Fine Motor Skills study. The experiment is helping researchers understand how astronauts concentrate and work on detailed tasks and sensitive equipment during and after a long-term space mission. After the drill, the trio split up as Kopra studied liquid crystals to help engineers design better display screens for use on Earth and in space. Peake moved on to the Magvector experiment and studied magnetic fields and electrical conductivity, possibly setting up the space station for future astrophysics research. Cosmonaut Yuri Malenchenko investigated the forces the station experiences during orbital reboosts, spacecraft dockings and spacewalks among other activities.